Chasing Aurora has the distinct honor of being the first downloadable game on the Wii U that Family Friendly Gaming has reviewed. This is one downloadable game that families will take great interest in. This home console game provides two kinds of game play for families. The first aspect of Chasing Aurora is the Challenges. The player flies their bird around the level going through all these gates. They keep going until they eventually run out of time. The kicker is there are gates that will add to the players time. Score high enough to unlock the next level. 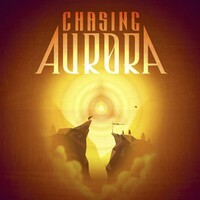 The second aspect of Chasing Aurora is the Multiplayer modes. There are multiple different kinds of multiplayer games in Chasing Aurora. Play one with up to four family members to unlock the next one. There are things like Freeze Tag, and Hide and Seek that will help families play together. The whole flying around as birds in Chasing Aurora is a really cool concept. My youngest son was playing with me and wanted to know if we walked around in levels. I had to explain to him we got to soar like eagles do. He did not believe me until we started playing Chasing Aurora. Then he was ashamed he ever doubted my wisdom. Chasing Aurora believes in sharing. This may sound strange when applied to video games. Let me explain. In the multiplayer modes, family members swap the Wii U Gamepad. That way everyone playing gets a turn on the Wii U Gamepad. No one family member can hog it. This is how Chasing Aurora encourages sharing. I really like Chasing Aurora. It is fun, and almost completely non-violent. A player will drag a gem around in the levels. That gem can be taken to fire pits. If another player makes contact with the flaming gem, they turn into a ball of flames and get stuck for a bit. That is as violent as Chasing Aurora ever gets.